FILE - An employee removes a covering of 13-meter aluminium ingots at the foundry shop of the Rusal Krasnoyarsk aluminium smelter in Krasnoyarsk, Russia, July 27, 2016. 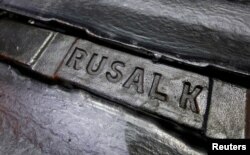 Rusal is among Russian companies on a new U.S. sanctions list. With the firm's own storage space filling up with unsold aluminum, Rusal executives in Sayanogorsk, in southern Siberia, have had to rent out additional space to accommodate the surplus stock, one of the sources told Reuters. "Aluminum sales have broken down. And now the surplus aluminum is being warehoused in production areas of the factory itself," said someone who works on the grounds of one of Rusal's two plants in Sayanogorsk. Several people connected to Rusal said that Oleg Deripaska, the company's main shareholder who along with the company was included on a U.S. sanctions blacklist, visited Sayanogorsk this week for a closed-door meeting with staff. A number of traders and customers of Rusal's aluminum have stopped buying the firm's products, citing the sanctions risk, and Rusal has stopped shipping some of its products for export, according to a logistics firm and a railway operator that used to carry much of its aluminum. At Rusal's two plants in Sayanogorsk — which together accounted last year for about a quarter of the firm's production — aluminum is now stacking up in ad hoc stockpiles dotted around the factory grounds, the sources said. FILE - Aluminum ingots are seen stored at the foundry shop of the Rusal Krasnoyarsk aluminum smelter in the Siberian city of Krasnoyarsk, Russia. A contractor at the Sayanogorsk plants said the stockpiled ingots, stacked on pallets, were building up fast. He said two days' worth of production would fill up a five-car train, but already a week had gone by with aluminum piling up. "Can you imagine a week?" he said. "There's a hell of a lot there, a hell of a lot. It's being stockpiled, it's not being shipped." "The storage is not quite full," said the electrician, who spoke on condition of anonymity to discuss internal company affairs. "Something is still being loaded all the same, some stuff is being shipped." Washington said it took the measure against Deripaska and others because, it said, they were profiting from a Russian state engaged in "malign activities" around the world. Since the sanctions were imposed on April 6, Rusal's share price has slumped, the value of its bonds has plummeted and partners around the world have distanced themselves from Deripaska and his business empire. Rio Tinto, which supplies bauxite to some of Rusal's refineries and buys refined alumina, said it will declare force majeure on some contracts. Further besieging Rusal, creditors and bond-holders are trying to offload the firm's liabilities because many financial market players believe that to handle Rusal debt could leave them too susceptible to U.S. sanctions.